Religion • “Lack of clarity” in statutes led to confusion over legal registration. 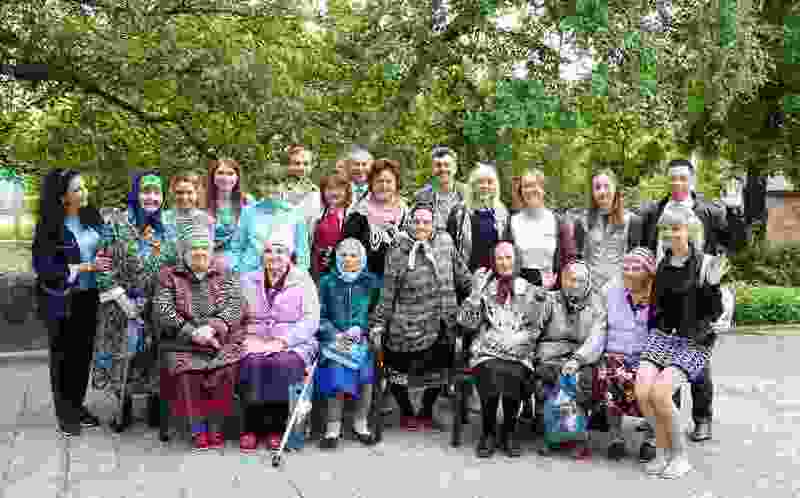 photo courtesy LDS Church Church members help the elderly during an activity in Russia. The LDS Church secured a small legal victory in Russia recently, when that nation's Constitutional Court ruled that two Mormon volunteers — formerly known as missionaries — were wrongly deported. In 2015, Nathaniel Joseph Worden and Parker Drake Oldham, both U.S. citizens, arrived in Samara as volunteers to provide "spiritual support to Samara members of The Church of Jesus Christ of Latter-day Saints," according to a release on the faith's Russian news website, "and received a migration registration at the location of the church's religious organization." Area police, however, considered "registration at that address an administrative violation," the release said, and "evicted and deported" the pair. The Utah-based faith appealed the action in court, arguing that the church's "Religious Association (its designation in Russia) was "trying to do everything to ensure their temporary stays in [the] country are documented in accordance with the law, and we strictly control their conduct." Russia's Constitutional Court ruled that there was "lack of clarity" in the statutes governing migration, which led to confusion over legal registration. "We are pleased to note that the Constitutional Court has agreed with our position,"the church said in its release. Last July, Russian President Vladimir Putin signed into law an anti-terrorism measure that strictly regulates religious work. The legislation increases phone and social media surveillance while seeking penalties for online extremism — including fines of up to $15,000 and possible deportation for conducting religious missionary work in private residences. The LDS Church immediately took steps to limit its proselytizing in the country (even reducing the number of missions it has there from seven to six) and has repeatedly stated that its members and volunteers will "honor, sustain and obey the law." "While we don't always agree with the restrictions or regulations placed on our volunteers and missionaries," LDS Church spokesman Doug Andersen has said, "we always abide by those rules and teach our volunteers and missionaries to do so as well." Regarding the two deportations, the Constitutional Court also ruled that the legal actions in the cases of Worden and Oldham "need to be reviewed." The two were part of six LDS volunteers who were detained last fall. Oldham, who is from Utah, and Worden were reassigned to Ukraine and have since completed their volunteer service. Both said in the release "they were satisfied" by the decision. Worden said he "loves Russia, where he spent a few unforgettable months, and the unjust deportation has not changed his feelings toward the country and its people." Oldham said he hopes for a just resolution of the dispute and believes that he will be able to visit Russia again someday. — Desk editor Michael Nakoryakov contributed to this story. Correction: July 21, 8:55 a.m. • The two missionaries arrived in Samara in 2015. An earlier version gave a wrong date based on incorrect information in a news release.